Multi-axis milling (especially five-axis) is in the ascendant for high precision manufacturing of a product with a sculptured surface such as ship propeller, owing to its multi-axis linkage and resulting outstanding superiorities. Needs of a faster-improving manufacturing level of sculptured surface milling are derived by higher performance requirement of complicated equipment, which makes the planning of tool orientations more significant and challenging. 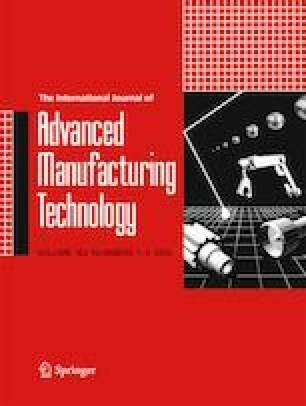 This paper builds a tool orientation optimization model with inclusion of the influence of deflection error caused by cutting force to achieve better machining precision controlling in five-axis sculptured surface milling. The basic idea of the optimization method is described firstly, followed by the prediction of cutter deflection error. Then determining processes of the related subset to restrain the tool orientations are developed. Lastly, comparative experiments are designed and performed through milling a propeller rotor possessing numerous blades in a five-axis machining center. By comparison with several other tool orientation methods, the average values and volatility of deflection error are both suppressed better utilizing the optimization modeling. The experiment results reflect that it is insufficient to consider single geometric constraint or kinematic constraint, and greater attention should be paid to the role of cutter deflection caused by cutting force in planning the tool orientations. This work was supported by National Natural Science Foundation of China under Grant No. 51605346 and China Postdoctoral Science Foundation under Grant No. 2016M602374.